Today has been a good day for dogs and a lazy day for me. Friday, I spent time figuring out what I do, why I do it, and what I really should focus on. Yesterday, I ran errands and did chores – a typical Saturday. Normally, on Sunday, I would work… work on rescue stuff, work on NSCA stuff, take Snick for his shelter visit, answer email, do some web development or updates for clients or one of my clubs/charities, etc. NOT TODAY! I started the day with good intentions, but after making breakfast for me and T, I went outside with the dogs and my Brugo full of fresh coffee and it was 52 degrees and sunny. Our yard has been alternating between frozen and flooded for the past few weeks, so we were all happy to lounge in the sun for awhile. Here are a few photos and videos of our sunny yard time. 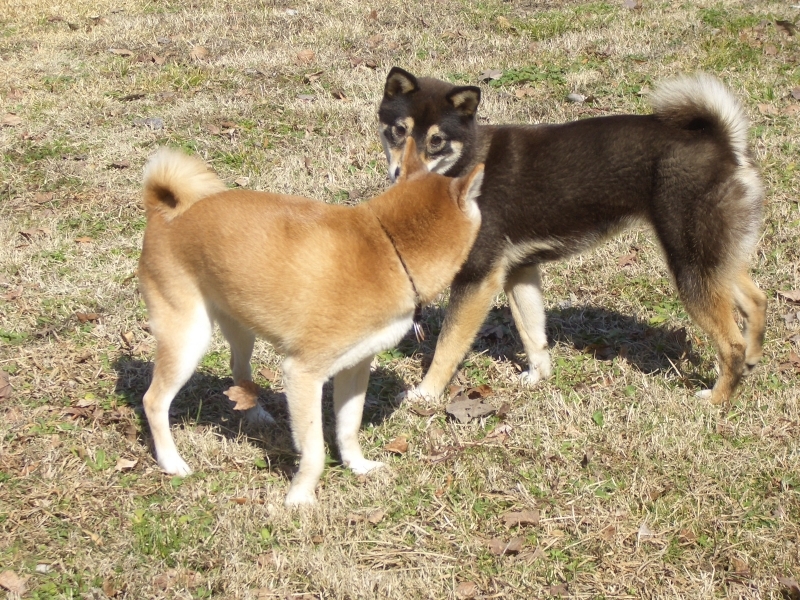 As you can see, Sophie tries really hard to get Secret to play with her. She mostly steers clear of Snickers so they don’t fight. 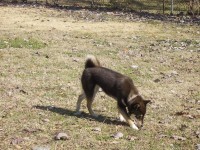 I’ve been working on getting Snickers and Sophie to play in the yard. 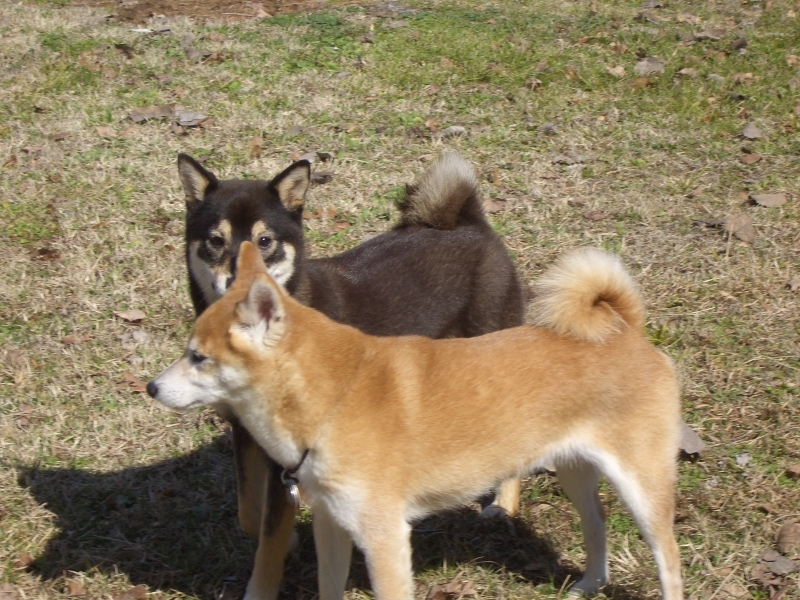 I usually have to chase Snick around and, once he’s running, Sophie will join in and they’ll run some Shiba 500s together. We’ve done that every morning for the past few days. I never get that on video though, because I’m running around like a lunatic, waving my arms and saying “Get her Snick. Get her!” (I’m sure my neighbors are ready to have me committed.) Even with playing a little outside though, they’ve still been fighting in the house. Whenever they end up in a small space together, Sophie gets excited and starts fly snapping or barking and Snick interprets it as aggressive or rude and attacks her. Well, today, we had a HUGE breakthrough. I put baby gates up a day or two after Sophie arrived. I lets Snick and Sophie be around each other without fighting and that seems to be helping. Sometimes, when Sophie is relatively calm, I let her out to hang out in the den "with the big dogs." She was pretty good and Snick eventually decided to get off the couch to play with her. I was worried. When he first invited her to play, she play bowed back at him, which was ADORABLE. They played briefly and then she started barking at him. That’s about the time I got the camera running, so this is pretty noisy footage. I was VERY proud of Snickers that he didn’t attack her for barking. It did start to get too heated right at the end though, so I stopped the camera and split them up before it turned into a fight. Note at 12:17 AM: Snickers and Sophie just had their worst fight so far (of course). On the upside, it ended with Sophie cowering upside down in a corner, so maybe she’ll start to figure out she needs to respect Snickers. Maybe. It doesn’t surprise me that the best day ended with the biggest fight, LOL. However, it’s a great sign that Sophie may be learning her place in the pack. After weeks and weeks of random fights and Mox pretty much ignoring her, Luna ‘got’ the rules and they immediately became best friends. It was like a light switch being flipped ON! Hopefully Sophie will “get it” like Luna did! well jenna I was just watching this and when sophie started barking so did Bodhi! That would be fine at home but we are visiting a friend in Evanston and NO DOGS allowed. So Bodhi had to be secreted in and I slip out in dark to walk him. 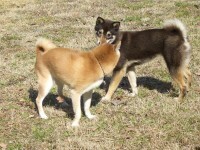 We just returned from the Shiba Meet Up and boy, it was fun but very sad to see so many injured and harmed shibas for adoption. I would like to talk with you by phone, is that possible?